If you've seen my previous posts (in particular those featuring No Bones About It), you'll know that I love to put little scenes together - so this gorgeous set was a must have for me and I've finally had the opportunity to get inky with it! This was my first card but I'm sure it won't be my last! Products from the new Occasions Catalogue are available for purchase from 5th January (very soon now!). Remember that Sale-A-Bration also starts on 5th January and for every $90 you spend you can choose a FREE ITEM from the Sale-A-Bration catalogue. If you don't have catalogues or a Demonstrator and you live in Australia contact me to get some. So how did I make this card? I started by stamping the deer in black and then masking them. Next I stamped the mountains with Elegant Eggplant and again (without re-inking the stamp) slightly above and to the left and then a third time in between to create a range of mountains disappearing into the distance. I coloured the mountains with sponge daubers and Wisteria Wonder ink (for the more distant mountains) and a light coating of Elegant Eggplant . I used a little more ink in places for shadows and crags. I used a sponge dauber and Pear Pizzazz ink to create grasslands - getting lighter near the mountains to give an impression of distance. I added Mossy Meadow and Early Espresso inks to the tree stamp using Stampin' Write Markers and then stamped the trees (twice). 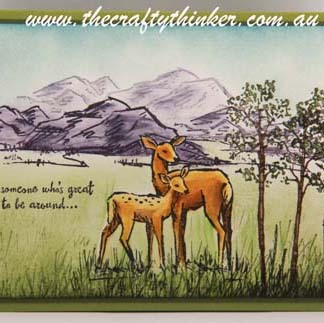 At this point I removed the mask from the deer and watercoloured them with Delightful Dijon and Soft Suede inks. 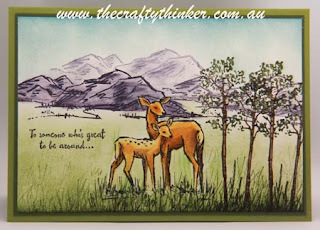 I stamped the grass image with Pear Pizzazz in the foreground and lightly stamped this off heading towards the mountains a bit to give a bit of texture to the grasslands. I then used the same grass stamp with Mossy Meadow to add some shadowy depth to the foreground (especially under the trees) and sponged a little Mossy Meadow to the bottom edge to finish giving depth to the foreground. I used a sponge dauber and Soft Sky for the sky and then added a little Marina Mist to the top edge. The sentiment is from the same stamp set and I placed it in the grasslands with black ink. 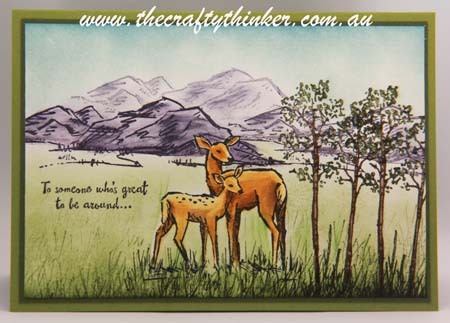 The stamped panel was matted onto Mossy Meadow cardstock and then placed onto the Old Olive card. Well, this is my last post for this year - see you in 2016 and I wish everyone a wonderful New Year! You did a nice job on this. It is the best card with this stamp set that I have seen. I'd like to attempt casing it if you don't mind. 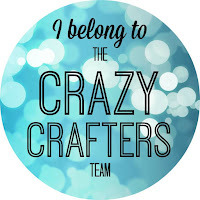 Hi Tonilea - thank you so much! Thank you so much for asking about casing. Of course you can! Everyone is welcome to CASE as long as they give credit where it's due. Do let me know how you go with it! Thank you, Kylie, that's so exciting! You are so kind and generous (as well as talented). I'm so sorry that it has taken me so long to thank you for your very kind comment - I am very grateful to you and so glad you like my card. Thank you.